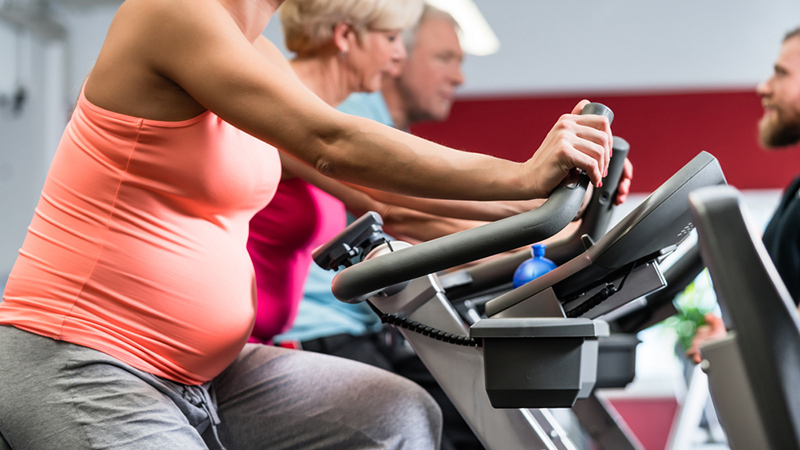 Staying fit during your pregnancy isn’t just good for you; it’s also good for your baby. According to a review study from Obstetrics & Gynecology, regular supervised workouts during pregnancy not only helps mothers-to-be stay in better shape — both mentally and physically — but it also helps encourage a healthy birth weight, as well as lower odds for cesarean delivery. According to guidelines from American College of Obstetricians and Gynecologists, pregnant women should focus on moderate intensity for their workouts. The Cleveland Clinic recommends the following healthy activities during pregnancy, as they carry little risk of injury: Brisk walking or light jogging, swimming, indoor stationary cycling, pre-natal yoga and low-impact aerobics (taught by a certified instructor). You may have to adjust your workouts as you get bigger, so consult your doctor, listen to your body, and do what feels right for you. 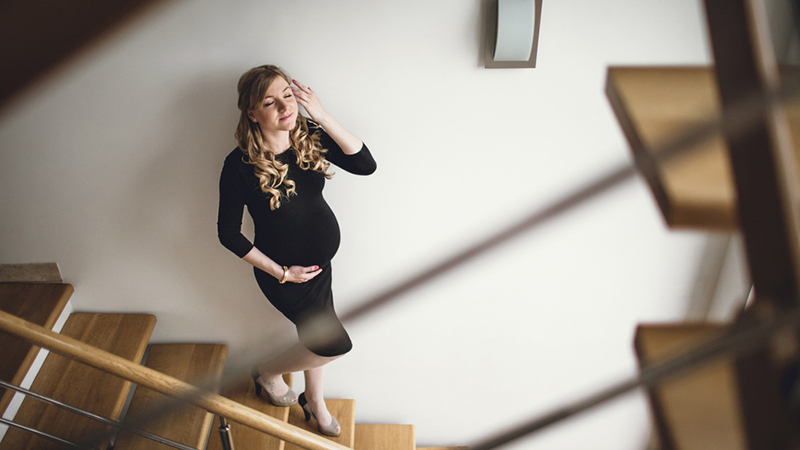 Here are 10 low-impact moves you can do throughout your pregnancy after getting the all-clear from your doctor. Do what you can, working up to 10 reps on each side for each exercise. Pregnancy can be strenuous on your back, so get some relief by strengthening your core and glutes. Mayo Clinic recommends this move to tone the back, core and glute muscles. On your hands and knees, keep your arms straight with your hands directly underneath your shoulders. Lift one knee off the floor and straighten your leg directly behind you. Your back and leg should form a straight line. For added difficulty, balance on one arm and lift the opposite arm in the air. Do this only if you can find your balance. Since your center of balance shifts to the front of the body during pregnancy, the chest muscles can become tight. Fitness expert Denise Austin says this move can help alleviate this tension. Begin by marching in place, at a pace that increases your heart rate slightly. Make sure you bring your knees up high. As you do so, extend both arms out straight, opening and stretching your chest muscles. For some women, it’s hard to feel elegant during exercise, but this is a pretty move that fitness instructor Jessica Smith demonstrates in her video. It’s like a regular squat, in that you lower your body, bending at the knees, as if you’re about to take a seat and then stand back up. Your hands are on your hips, and feet are about hip-width apart. But you point your feet out slightly, like a ballerina. As you squat down, your knees follow in the direction of your toes. Smith does say, though, if you do feel any pressure on your knees, change the distance between your feet until you feel more comfortable. Hips change position during pregnancy. Performing regular side leg lifts can help your abductor muscles, and because this move is done on your side, these exercises can be done well into your pregnancy. Add ankle weights for added resistance. The arm that’s closest to the floor should be extended straight above your head and shoulder while your other arm is bent with your hand on your hip. Your legs should be extended and stacked on top of one another. Slowly raise your top leg as high as you can. Pause, then return to the starting position. Begin by standing in front of a bar or a chair. Keep your elbows bent softly and lean your chest in. Position a small fitness ball behind one knee, squeezing it between the thigh and calf. Pulse the leg back, and repeat on the other side. Swimming is great for pregnant women because it allows you to be active without added pressure on your joints. If you have access to a pool, try water-running or walking. According to sparkspeople.com, beginners should stick to the shallow end, and walk or run as you would on land.The water will provide resistance. Start off doing short intervals of two to three minutes of fast walking or jogging followed by at least a minute of rest. As your fitness builds, increase the length of your walking/running intervals. While you’re in the water, do this move too. Trish Del Sorbo, director of Baby & Me Fitness tells Todaysparent.com that treading water raises your heart rate and increases stamina. As long as you can swim, try treading in the deep end using only your legs. If you need some help staying afloat, sit on a pool noodle. You can modify this for more advanced levels by using one leg at a time, alternating arm movements or holding hand-held water weights. No reason to miss out on spinning during pregnancy. In fact Women’s Health recommends this stationary bike workout for the second trimester. Start out with a five-minute warm-up at 50 percent effort. Then, for two minutes, pedal at 60 percent. Then, lower the intensity to about 30 percent effort for two minutes. Do this about four to six times, and finish off with a five-minute cool down at 40 percent effort. She recommends about 20 minutes of stair walking (going up and down) as a workout that’s safe up to 36 weeks. Start off with a three to five minute for three days a week, and every two to three weeks, add another day, until you’re doing it five days a week. She also offers intermediate and advanced walking works, too. Listen to your body, take it easy, and do what’s best for you and your baby.